In the pre-dawn darkness on Saturday the 18th of June, twenty-five volunteers and one Park Ranger were greeted with perfectly calm conditions for Tarra-Bulga National Park’s Annual Lyrebird Survey. Overnight showers had passed by leaving moist dripping foliage in their wake. The survey is designed to monitor the density of Lyrebirds living in 60ha comprising of wet sclerophyll and cool temperate rainforest immediately to the east of the Tarra-Bulga National Park Visitors Centre. There are sixteen monitoring points strategically placed throughout the site and volunteers move to each site before adult male Lyrebirds start their morning calls at dawn. Volunteers then use a compass to record the direction and proximity of the Lyrebird calls. This year we had enough volunteers to cover all but one of the monitoring points. 2016 Lyrebird Survey crew ready for action. Following the survey, lines representing the direction of the calls are plotted onto a map, and triangulation is used to establish the spots where birds were calling from. This year the results indicate we had at least nine (male) Lyrebirds calling in our 60ha zone. This corresponds to a density of one adult male Lyrebird per 6.7 ha. You can also assume that there will be female lyrebirds and immature males or non-calling males within our target area. To account for this to get our overall population of Lyrebirds we multiply the number of calling males by a factor of 2.5. It is believed that male Lyrebirds do not begin to breed until they are around 6 or 7 years old. Map showing bearings taken from monitoring points and the estimated location of calling male Lyrebirds from the 2016 survey. The Annual Lyrebird Survey at Tarra-Bulga National Park has been carried out for the last 20 years as a means of detecting any changes of the population of the birds, within an area of the park covering from around the visitors centre area to the rainforest gully at the headwaters of Macks Ck. Although Lyrebirds are not considered endangered, they are at risk from natural disasters such as bushfires, habitat decline and attack from foxes, feral animals and domestic cats and dogs. The annual survey contributes to long term data on the density of the local population and helps park management plan their future management actions. Superb Lyrebird calling from a tree branch. The Lyrebirds are counted not by attempting to spot them visually, but by listening out for their song. (Sometimes you may be lucky enough to see a bird but often they are out of sight perched in a tree canopy or in ferny understorey). The survey is undertaken during the Lyrebirds’ breeding season. At this time mature male Lyrebirds are all actively searching for females to mate with and it is during this time when they are reliably singing for much of the day. The survey is consistently undertaken at dawn (when the wind is often calmer and the Lyrebirds begin their morning calls, usually while perched up in a tree). Volunteers gathering before the count. established monitoring points. Each of these points is marked with a numbered sign so that they can be found in the pre-dawn light. As the sun rises and the Lyrebirds start singing their varied repertoire, the volunteers use a compass to establish the direction the calls are coming from and estimate the distance (close, medium or far) that the call is coming from. The survey lasts for approximately 30 minutes, after which the volunteers generally go off and enjoy breakfast at the aptly named Lyrebird Cafe. Once the survey is completed survey sheets are collected and the direction the calls were coming from are plotted as lines onto a map, where lines coming from several surrounding monitoring points meet, we can be confident that it is a location where a male Lyrebird was calling from. Instructions on how to use a compass to find the direction the Lyrebird is calling from. This year our Annual Lyrebird Survey will be held on Saturday June the 18th. The more volunteers we have the better able we are to get an accurate indication of the number of birds in our survey area so attendance by anyone (no experience necessary) is much appreciated. The meeting point for all volunteers is at the park visitors centre at 6.15 am. The count takes only 30 minutes from the time the sun rises and the birds start calling, which means after you have enjoyed your free breakfast it will be about 8.30am and you will be free to enjoy the rest of your Saturday. To secure your place please email friendsoftarrabulga@gmail.com or call David on 0488 035 314 by this Wednesday. The last of our scheduled Healthy Park Walks will be happening this coming Monday on the Queens Birthday Public Holiday. This walk will take in cool temperate rainforest along with the famous suspension bridge. Starting at 10am from the Visitors Centre Carpark. Should be a great long weekend activity for anyone wanting to discover more about Tarra-Bulga while enjoying some casual exercise! The Friends of Tarra-Bulga National Park are holding a working bee on Saturday April 30th and are would welcome new or existing volunteers to come along. 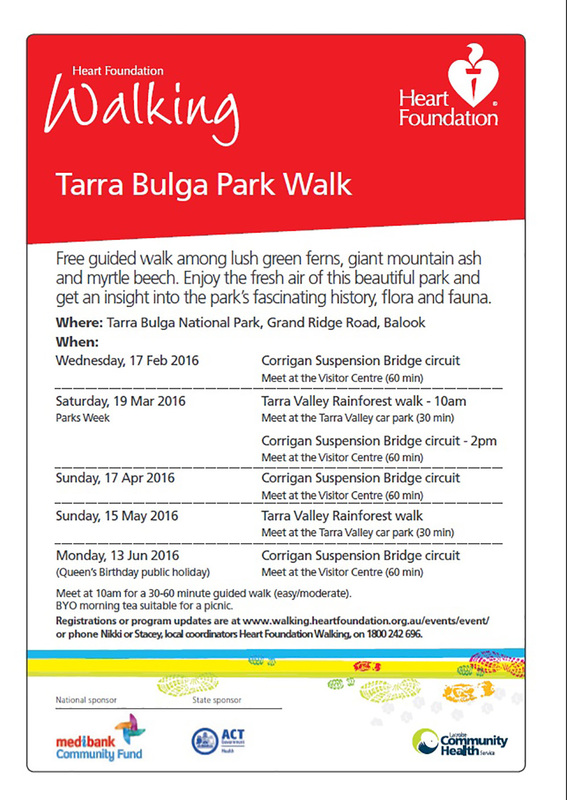 Special guided walks led by Friends of Tarra-Bulga National Park will be held this Saturday March the 19th. The park visitors centre will be open from 10am to 4pm and along with the usual displays and information there will be a special screening in the theatrette featuring images from our fauna monitoring program. To register for either walk (or both) go to www.walking.heartfoundation.org.au/events/event/ or phone Nikki or Stacey, local coordinators Heart Foundation Walking, on 1800 242 696. Healthy Park Walks are back for 2016 and the first one is this Wednesday February 17th.